This is a great take on pop corn shrimp. The secret ingredient is the brown sugar that aides making a really unique batter. Make Joes Crab Shack Popcorn shrimp at home with this easy copycat recipe. Place shrimp in a bowl, add garlic powder, brown sugar, and Tabasco Sauce and mix well. Marinate shrimp for 1/2 hour in the refrigerator. Beat egg and add water, blend well, set aside. Mix flour, cracker meal, bread crumbs paprika and Creole seasoning together and blend well. Assemble for frying of shrimp, one bowl for cornstarch, one bowl for egg wash, and one bowl for cracker mixture. Heat oil for frying, use your favorite form of deep frying. One piece at a time dust shrimp with cornstarch, then place lightly in egg wash then roll in cracker crumb mixture. Fry until done. Shrimp will float to top when cooked through, remove when done and place on paper towels. 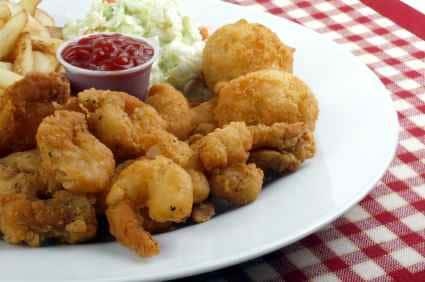 Serve with your favorite tarter or seafood sauce. My kids love popcorn shrimp so I was glad when I found this on your website! I have made it for them several times! They love it!